We have compiled an up to date Windows binary from the latest ccMiner 1.6.2-git by tpruvot (source). 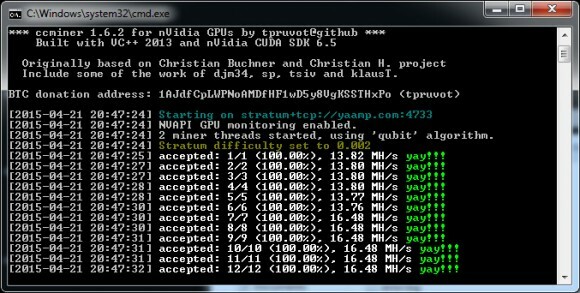 The ccMiner fork from tpruvot is with support for Compute 3.0 or later Nvidia-based video cards all the way up to the latest Compute 5.2 GPUs from Nvidia. The latest version includes some fixes and most notably the addition of Scrypt, Scrypt-N and Scrypt-Jane algorithms that are ported from CudaMiner that has already been outdated and not supported for a while. 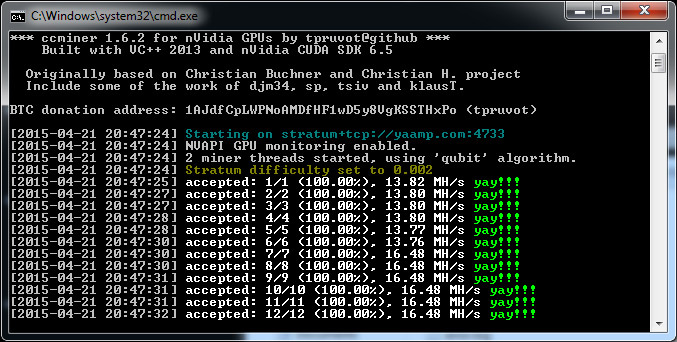 Not that it is much profitable to mine coins using these algorithms at the moment, especially Scrypt ones on the GPU, but still now you have support for them in ccMiner available. Since our last binary release there was also the addition of Double Skein Algo (Skein 2) that is being used by crypto coins such as Woodcoin. Our windows binary is compiled with VS2013 and supports Compute 3.0, 3.5, 5.0 and 5.2 GPUs, you can download and try it below, there is an example BAT file setup for testing.